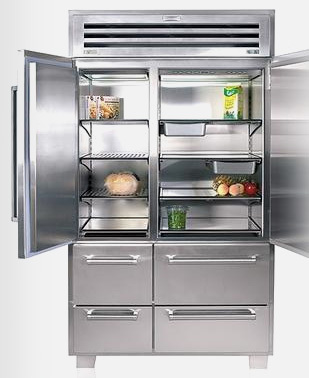 Below are some easy steps that you can follow to remove frost from your fridge or freezer. To permanently fix such a problem, look at the seal on the device and consider dehumidifying your home during the summer months. Remove all items that will perish when warm, such as dairy products, uncooked meats, eggs, etc. and place them into a cooler or several coolers. Or, if you have another cooling device such as a second fridge or freezer, move your food items there for the duration of this process. Fill up clean spray bottles with water above 100F. You should be able to find decent bottles at a dollar store. Spray the ice and frost that has built up in the fridge and freezer with the hot water. You may want to have a handy supply of towels to mop up the mess that will result. Or, if plausible, take the fridge outside so that the water can just be dumped out. Make sure the freezer is completely dry so that your hard work is not wasted. Dry off food packages as necessary when placing them back into the fridge/freezer to prevent excess water. Plug the fridge/freezer back in. Add some ice or cold packs to the coolers to help keep them cold during the defrosting process. Plan ahead; don't defrost right after cramming your freezer full! It's not necessary to keep soda cold during the defrosting process. Any food that can't sustain wetness should be in its own bag, such as a zip-lock bag. These items can include bread, cheese that is not in a proper container, and so on. Always put items that should be in the freezer into the same cooler, preferably without the normal refrigerator items - this will make sure the cold lasts longer. Don't open the coolers until finished. If you only need to defrost your freezer, leave everything in your fridge. It will keep cold for at least a few hours. In the future, don't let frozen goods partially thaw before entering the freezer. This brings un-needed humidity into the environment, which results in frost.